(Bloomberg) -- The openness of China’s financial markets to the rest of the world isn’t high, so there’s a lot of room for increased access, according to People’s Bank of China Governor Yi Gang. Yi said foreign financial services institutions should be treated the same as domestic ones in terms of shareholding proportions, scope of business and licenses. 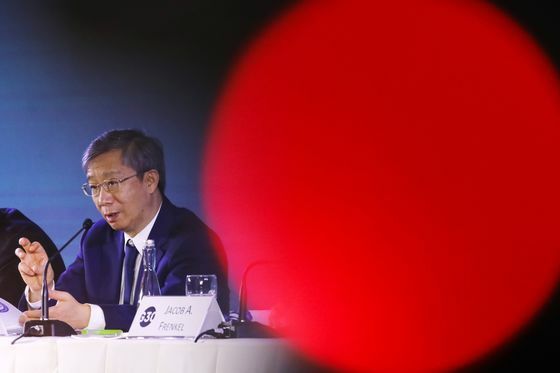 Speaking at a forum in Beijing on Sunday, he said the central bank will focus on providing more hedging tools in 2019 to help investors manage risks. Officials made repeated pledges at the China Development Forum over the weekend to open up more of the economy to foreign companies and ensure a level playing field with domestic firms. The government is also seeking to bring foreign expertise and capital into play at a time of slowing economic growth, high debt levels and concerns about long-term financial stability. “We need to improve the financial risk prevention mechanism in line with financial opening-up. The opening of the financial sector isn’t the origin of financial risks, but the opening could add to the complexity of risk control,” Yi said. He also promised to help people hedge their money in Chinese markets, something that foreign companies and investors have been asking for. “An important task for this year is to study how capital markets can more accurately determine prices, supply sufficient types of hedging tools so that all types of investors can more effectively manage risks," Yi said. He added that increasing the type of financial instruments available enables optimization of asset allocation. The Chinese currency is a topic in the ongoing trade talks with the U.S., with the Trump administration concerned about Beijing’s potential devaluation to blunt the impact of tariffs. According to Yi, a flexible currency exchange rate is a "complementary" step in China’s opening as it helps absorb risks. Top officials have previously promised that they won’t use manipulation of the yuan to gain a trade advantage. “The central bank has already withdrawn from day-to-day interventions and now more and more market participants are getting used to a flexible exchange rate,” Yi said, repeating an earlier pledge on exchange-rate reform. Also at the weekend, top officials pledged to lower tariffs and expedite debt sales in 2019 as they seek to manage the economic slowdown while tackling the standoff with the U.S. Vice Premier Han Zheng said the government will continue to cut import taxes and create a first-rate environment for foreign businesses, though he didn’t add details on tariff cuts. The government will speed up bond sales and the use of the funding to boost domestic demand, Finance Minister Liu Kun said at the same event.